An Admin Center for people who have no time for manuals. 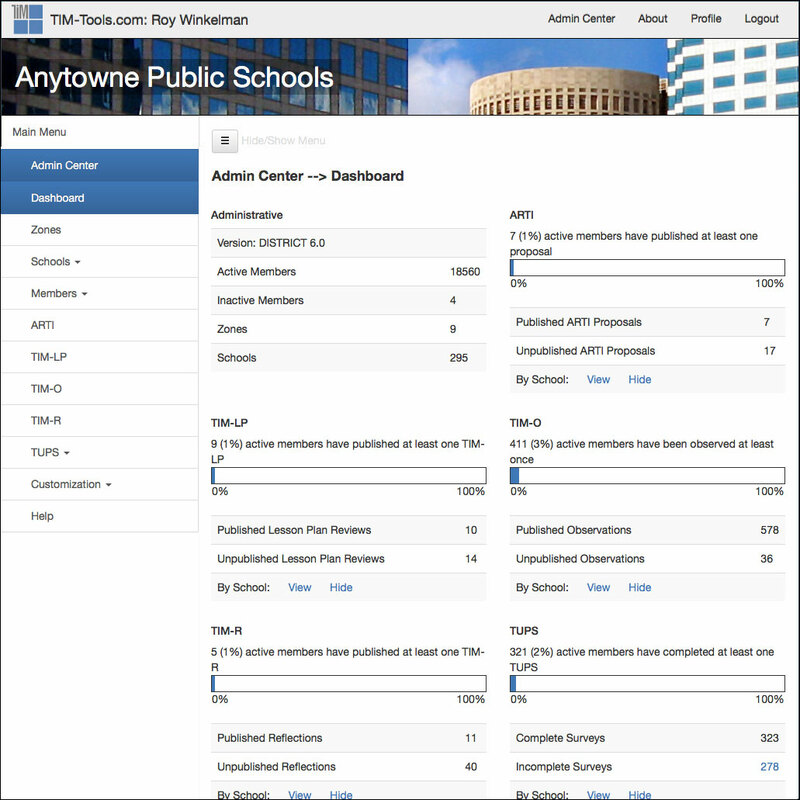 The processes for uploading schools and members, assigning administrators and observers, viewing summary usage reports and other common tasks are all explained within the Center. 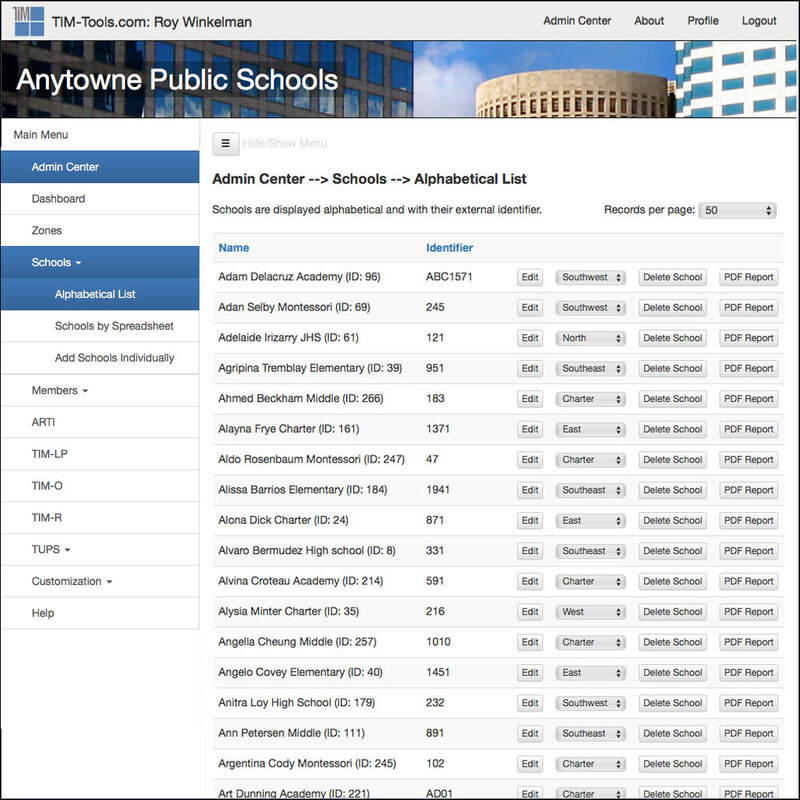 Most importantly, the Admin Center is where you will access your TIM Tools data. Pasting the raw data into specially-designed templates instantly generates extensive reports that identify needs, provide insight into the current levels of technology integration, and pinpoint the most pressing (and promising) professional development topics. 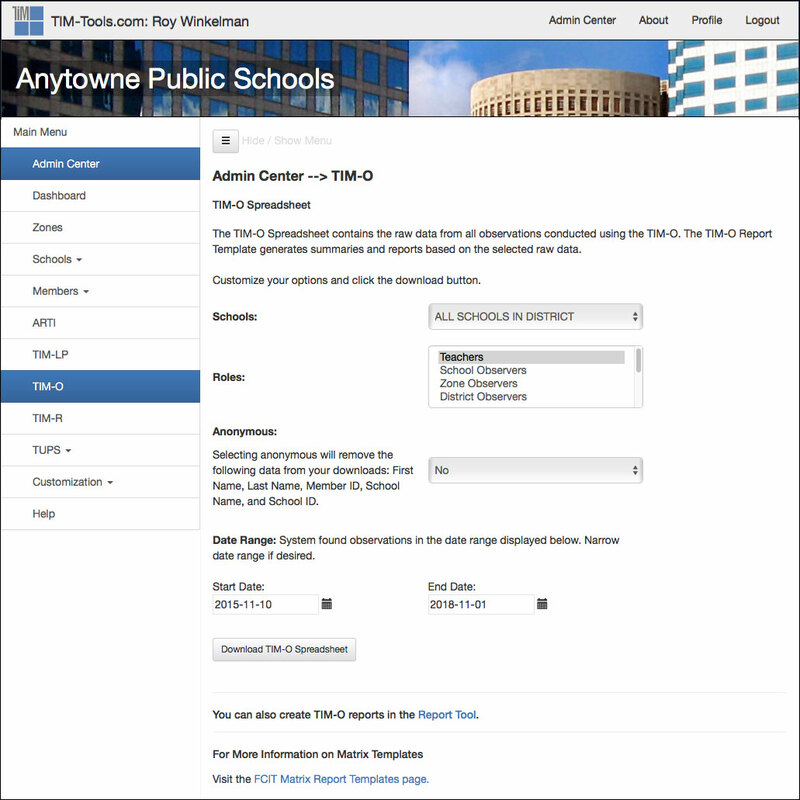 The TIM Tools Admin Center gives administrators the ability to upload lists of schools and members, create and configure role permissions, administer member passwords, and generate reports. 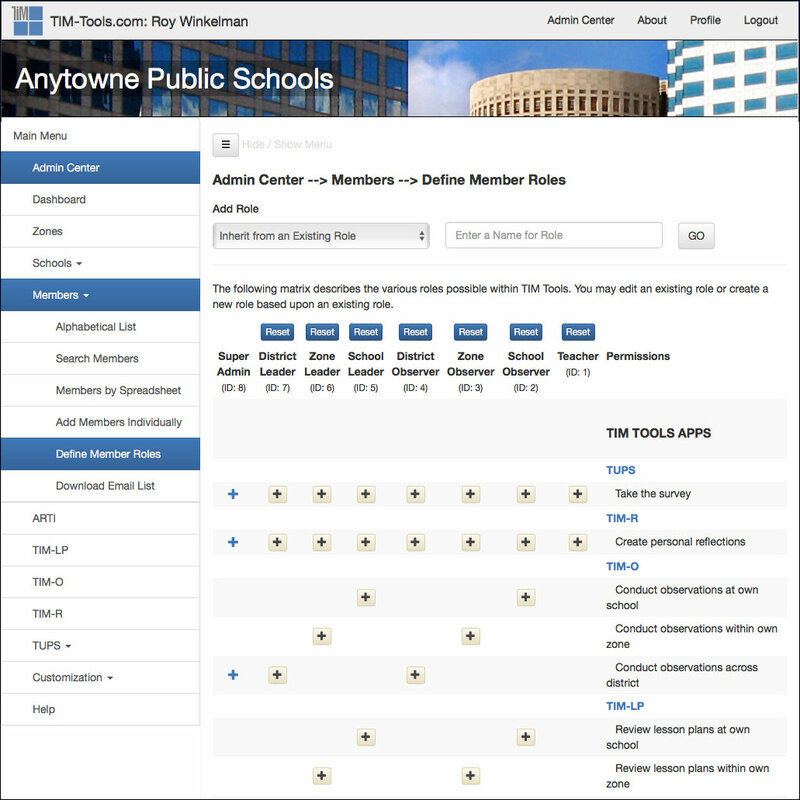 The district version also allows the grouping of schools into zones for administrative purposes. This allows TIM Tools to be used by regional service agencies, associations, consultants, and other school systems beyond the typical school district structure common in the United States. Figure 1: Dashboard. 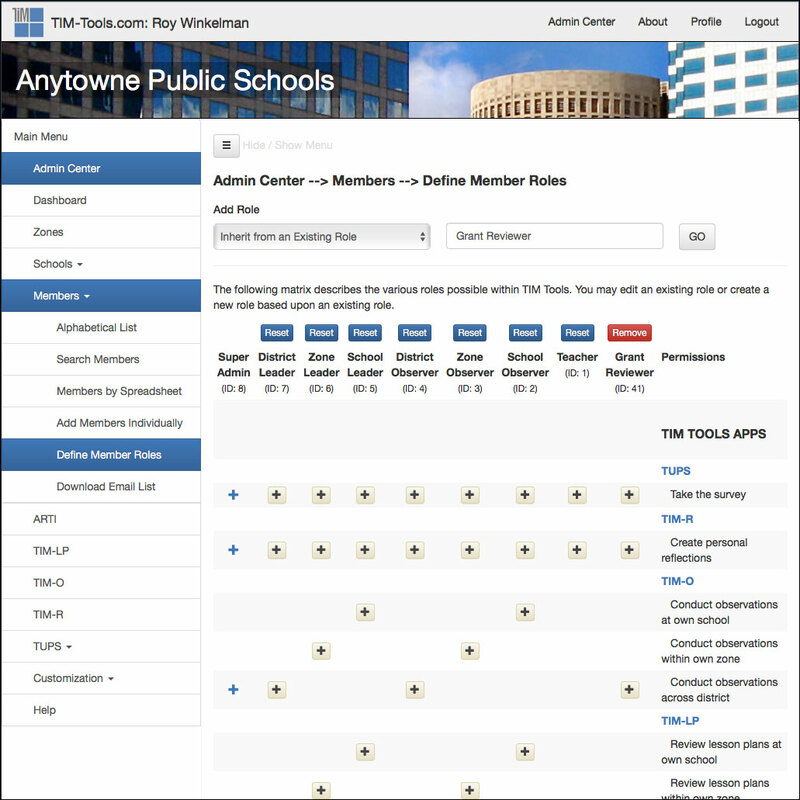 The Admin Center dashboard gives a high-level snapshot of general membership, schools, zones, and the total activity of each of the five tools. NOTE: Your district’s name will appear in the banner on each page where you see the words “Anytowne Public Schools” in the screenshots. Figure 2: Zones Panel. The zones panel allows a district to group schools into zones. This may be done to parallel administrative divisions of larger districts or to group schools for grant or research purposes. Figure 3: Schools Panel. The schools panel has three sections. One is a complete list of schools. 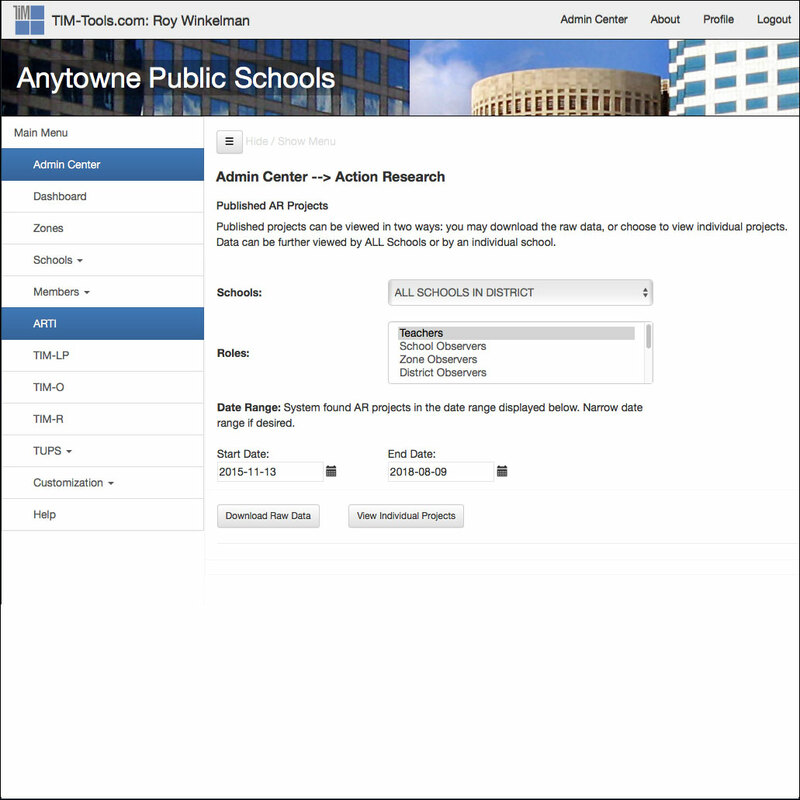 Here an administrator can edit the school name or identifier, assign the school to a zone, or generate a PDF report of TIM Tools activity at the school. The other two sections allow the uploading of schools by spreadsheet and the manual addition of one school at a time. Figure 4: Members Panel. All persons, whether teachers, observers, or administrators, are “members” in the system The six sections of this panel provide for the manual editing of members, a member search, the uploading of members by spreadsheet, the manual addition of members, the defining of member roles, and the downloading of a complete list of members’ email addresses. Figure 5: Roles Panel. The roles panel allows the the client to tweak the permissions of each of the default roles. Figure 6: Creating a New Role. The roles panel also allows the client to create new roles as needed and to assign whatever configuration of permissions is desired to each new role created. 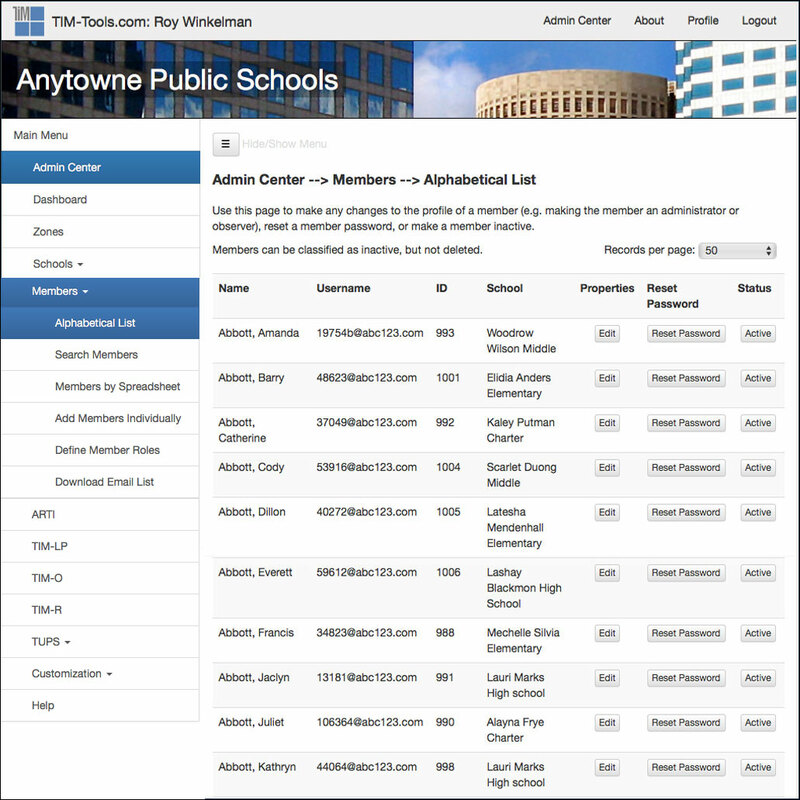 This feature allows great flexibility—especially when a TIM Tools instance is used by associations, agencies, consultants, researchers, and others who do not fit into a typical school district structure. Figure 7: ARTI Panel. The action research panel allows an administrator to view all ARTI proposals or to sort and view by school. Figure 8: TIM-O Panel. The TIM-O panel allows the download of all raw TIM-O data by school or by district for a given date range. There is also an option to anonymize the data if desired. The dowloaded raw data can be imported into your preferred statistics software such as SAS or SPSS. Most districts, however, import the data into our custom TIM Tools report templates, which generate extremely useful reports automatically. The TIM-LP and the TIM-R panels work in exactly the same way. Figure 9: TUPS Panel. There are five sections to the TUPS panel including a control for the maximum number of times an individual can take the TUPS, fields to edit both the welcome and the exit text, a download area for raw TUPS data, and an area that allows for the complete customization of the survey. Any section can be turned on or off, any individual question can be turned on or off, and any question can be edited as desired. Figure 10: Home Page & Application Customization. The default home page welcome message and image can be completely customized. Additional home page modules linking to the TIM, FCIT digital content, and iTeach may be turned on or off as desired. The Active Applications panel can be used to hide or show any combination of the seven tools within the TIM Tools suite. Figure 11: Site Banner Selection. 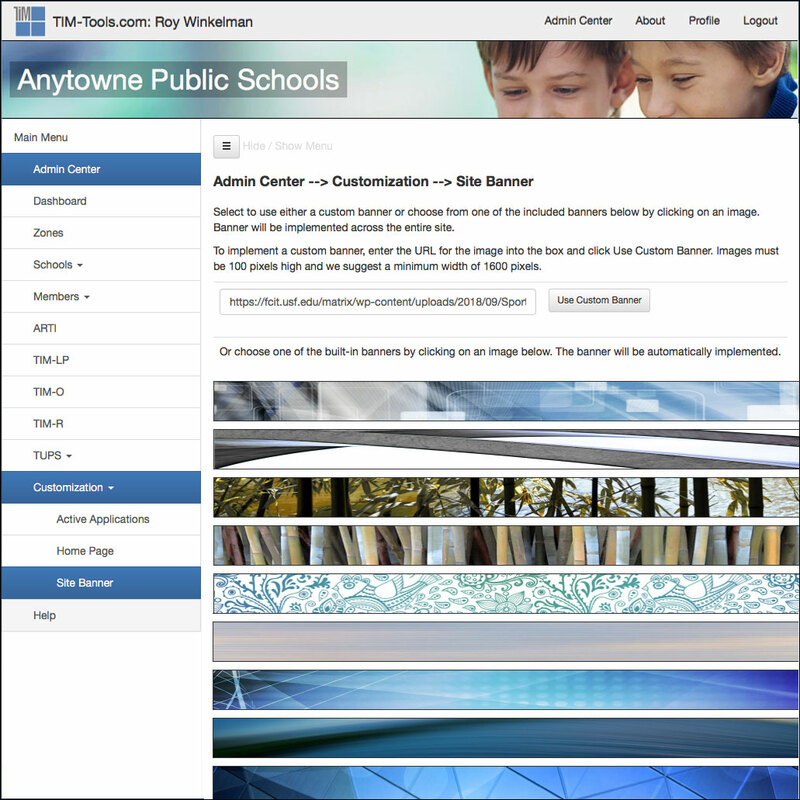 The Site Banner customization panel allows an administrator to select a banner image from our collection of over 100 photos and illustrations. Some districts keep the same banner throughout the year. Others prefer to change the banner frequently. Figure 12: Custom Banner. A district can also link to a custom banner if desired. 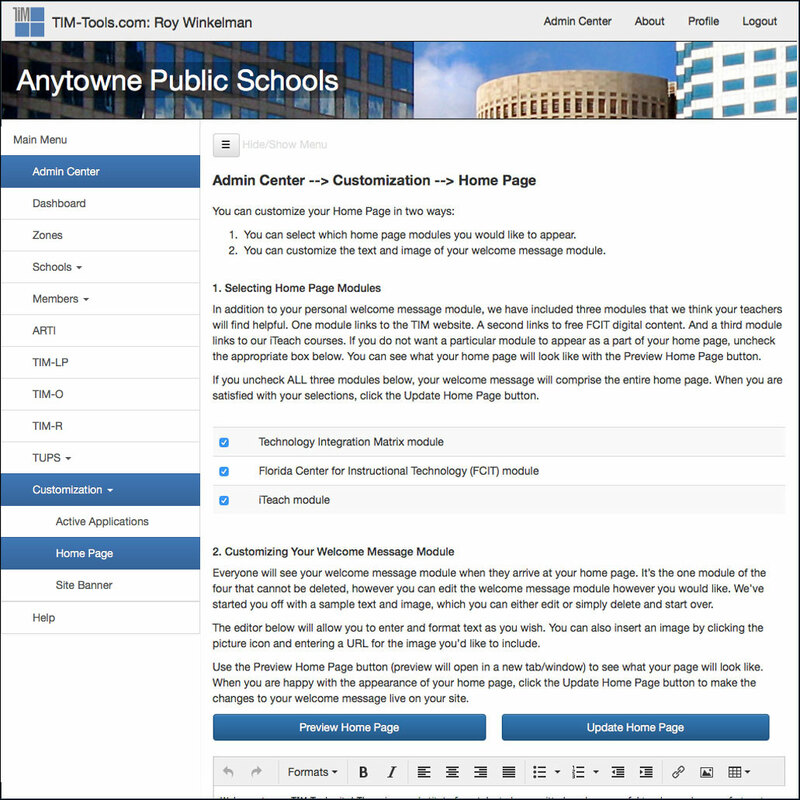 This allows a district to maintain a common visual identity across their public website and their TIM Tools instance. You can view the complete Administration Guide for version 6.0 online. Additional information about the Admin Center can be found on the Admin Center FAQs section and in the Teaching and Learning with Technology blog.